Elephantastic! How to Sew an Elephant? Tutorial ~ DIY Tutorial Ideas! * Unless stated otherwise, use a sewing machine for all the sewing. 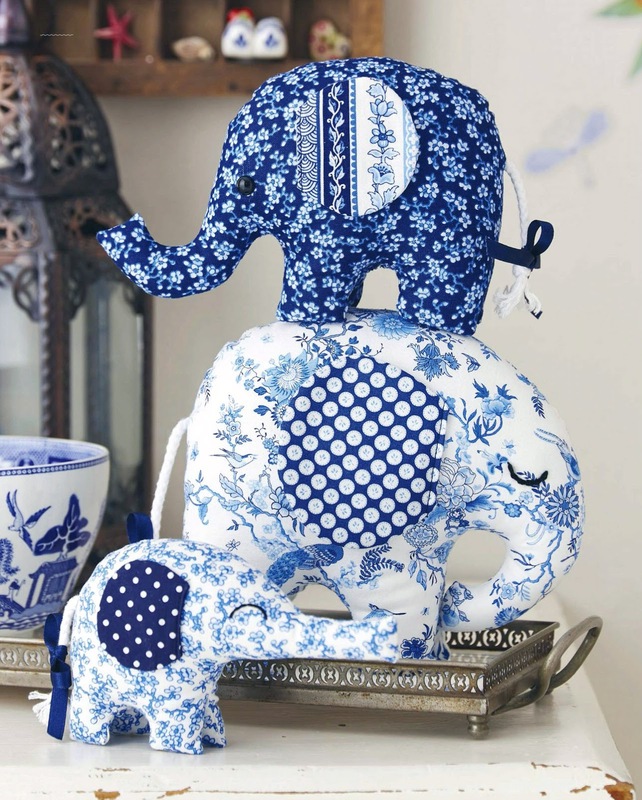 We think customers will find it hard to resist these gorgeous stacking elephants. Made from stylish blue and white oriental fabrics, they’re bang on-trend for summer homewares, too. They’re really simple to make and can be whipped up in just four hours or so, so are ideal for making to order in fabrics and colours to suit buyers’ decor. Advertise the fact that elephants represent strength, protection and good luck to make these a sure sales winner. 1. Use the templates to cut out the following: In Blue Birds and Flowers fabric, cut two Large Elephant Bodies and two Large Legs. In Blue Blossoms fabric, cut two Medium Elephant Bodies and two Medium Legs. In Oriental Packed Blossoms White fabric, cut two Small Elephant Bodies and two Small Legs. In Oriental Blue Leaf Motif fabric, cut four Large Ears. In the Oriental Stripe Blue and White fabric, cut four Medium Ears In the Navy Blue Dot fabric, cut four Small Ears. The templates include a 0.5cm seam allowance so there’s no need to add any more. 3. Press each ear flat with an iron, then turn the straight edges in by 0.5cm and press down. Pin each ear onto the correct body shape so it is in the middle and that the ears are level. On the small body, position the ear 3cm from the top. On the medium body, position the ear 3.5cm from the top. On the large body, position the ear 5cm from the top. Secure each ear in place with a single line of stitching down the straight front edge of the ear. 4. Draw a dot on each of the medium elephant body shapes, positioned just in front of the ear and where the trunk meets the head. Make sure the dots are in the same place on both body shapes. Cut a small hole on the dot and from the front, push the post of the eye through and secure the eye in place by pushing the washer onto the back. 5. On each of the small elephant body shapes, positioned just in front of the ear and where the trunk meets the head, sew a curved backstitch eye using all the strands of the black embroidery thread. Make sure the eyes are level on both body shapes and that the curves are the right way up (creating a stretched ‘n’ shape). 6. On each of the large elephant body shapes, just in front of the ear and where the trunk meets the head, sew a downward curved chain stitch eye, using all the strands of the black embroidery thread. Make sure the eyes are level on both body shapes and that the curve is the right way up (creating a stretched ‘u’ shape). 7. On each body shape, pin the correct leg shapes in place, so the edges meet and the right sides are facing each other. Sew all the sides of the legs except the top edge. 8. To make the tails, cut piping cord into three lengths: 14cm for the large elephant, 12cm for the medium elephant and 10cm for the small elephant. Tie a knot in one end of each tail leaving 2cm of the cord on the end. Separate the strands of the cord on the short end to make it fluffy. 9. Pin the body shapes right-sides together. Above the back legs, place the knotted end of the tail inside the body and pin the other end between the edges of the body shapes. On the small elephant, put tail 7cm from the bottom; on the medium elephant, 9cm and on the large elephant, 12cm. Sew body shapes together from top of one leg to top of other leg. Cut notches in the tight curves of the seams to prevent bunching. Turn through. 10. Stuff each elephant with toy filling and sew up the gap between the legs using a blind stitch. Place the medium elephant on top of the large elephant so they are facing the same way and sew the medium elephant’s feet onto the large elephant’s back using a blind stitch. Place the small elephant on top of the medium elephant so all three elephants are facing the same way and sew the small elephant’s feet onto the medium elephant’s back using a blind stitch. 11. Cut three 30cm lengths of blue ribbon. 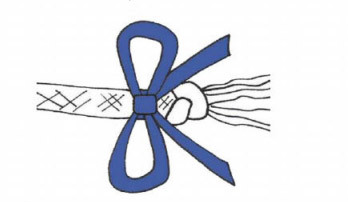 Wrap a length of ribbon around each elephant’s tail and tie in a neat bow, to finish. I really need help with printing these elephants I want them bigger but have no idea how to do that for each elephant.. Do you have them anywhere that are bigger then the ones in the picture here?? I am not smart at all when it comes to this.. it there a link I can just go to and print them without s much stress??? thank you kindly I appreciate any help you would be willing to give me.. my email is godsangel_77@live.com it you could send each size to me where the big one is 12: tall and the next size 9" tall and baby 7" tall thank you.. I would love to know the percentage to enlarge this pattern as well! So cute! I'm not an expert, but most patterns are printed out to a one inch square. 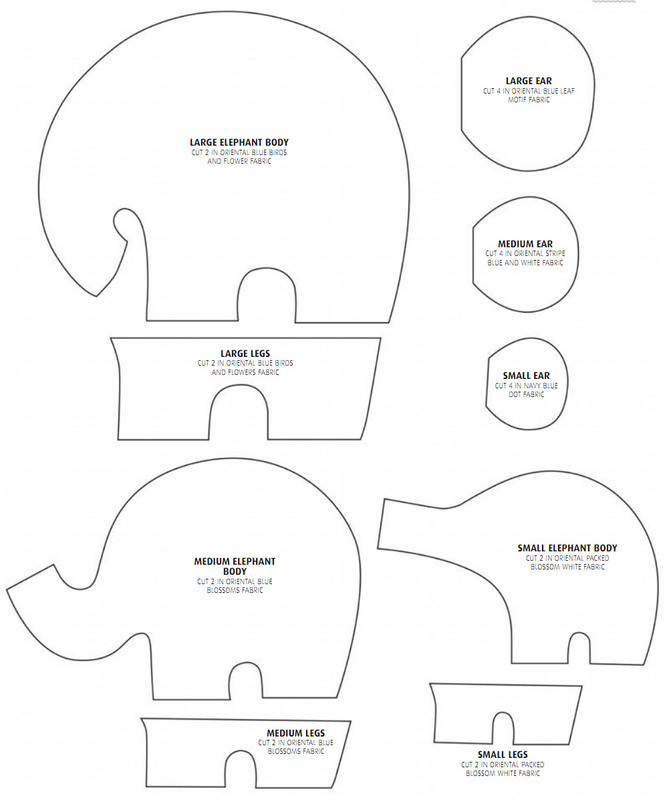 In other words, print out a square, make SURE it is one inch, and that should be perfect for the elephant patterns. Beautiful patterns! Square - do you mean 1" scale? Meaning, one inch of pattern = one inch of fabric? Because that doesn't really work here - it all fits on one sheet and clearly there are 3 elephants of varying sizes. I did convert into pdf and then print on 100% (without fit to page). It seems that it is the right size then at least according to the fabric sizes. I am making these right now, I printed the pattern then enlarged on a printer. On my printer I enlarged 210% of original making the med, elephant 10.5" across and 7" tall. Make sure to adjust the material quantities to match. If your print does not enlarge any office depot or fed Ex store can do it for you. I too thank you for all the time you saved me figuring that out! If you don't have a printer with a zoom feature, you can use an online program called BlockPosters... this program will increase the pattern to the size you want with multiple pages if you want it quite large.